We’re Passionate about Mobile User Interfaces, Experiences, Interactivity, and more! The London Games are are in full swing and the television ratings alone stagger the mind, but that’s just a small part of the overall picture. Broadcasters are limited to just one country or region, but digital viewership – and mobile advertising - has no such restrictions. This year, YouTube will live stream the year’s biggest sporting competition throughout the world. And, since so many viewers will watch the London Games on mobile, HTML5 mobile rich media ads are a great way to engage that huge audience. 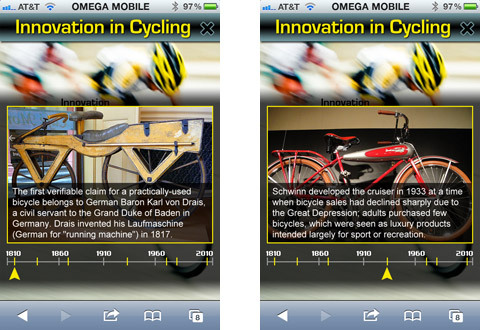 The mobile ad presents users with a fully interactive timeline that they can easily navigate by touch. It can appear within an app or a mobile site, or it could be a stand-alone microsite. Either way, the mobile ad shows key moments in the history of a sport – like inventions, innovations, major new records, and the year the sport entered the Games. One or more of the points on the timeline ties in directly with the advertiser’s message. A mobile ad like this presents information that viewers won’t get from the Games themselves. The broadcast of the cycling competition doesn’t talk about the history of cycling; it talks about who’s winning the race. The mobile advertising timeline concept fills in that gap and complements the experience of watching the Games, for experts and new fans alike. It can even reach fans who are actually at the Games in person – something television ads can never do. And, since users specifically choose to look at the timeline for each sport, we know they’re particularly engaged: no need to worry about wasting impressions on fencing fans when you only want to reach cyclists. The Sports Timeline concept is not limited to sports drink or equipment manufacturers. The mobile ad is an exercise in branding. It aligns a company with a particular concept and with the Games as a whole. i For example, a digital camera maker could mention the role of the “photo finish” in equestrian events to show off its history of innovation. Or an automobile manufacturer could demonstrate its commitment to sustainability by showing how energy-efficient cars with advanced GPS track cyclists along their route. Or the U.S. Marines might align themselves with fencing events, because Marines in uniform still wear swords! And who doesn’t love swords? You get the idea – the Games are a treasure trove of demographic data, regardless of industry. Don’t be shy of large events with worldwide audiences. Hundreds of millions are excited for the London Games. Mobile advertising provides opportunities to get in front of small slices of a very, very large pie, and it offers a more interactive and engaging experience than traditional television advertising. The timeline ad concept is just one example; it taps into the audience’s excitement and need for new information, and it offers genuine value. Every few years the world gets together on one stage to compete against each other in sports, but mobile advertisers are competing with each other in the business world every day. While athletes compete in London, smart marketers will take advantage of every opportunity they can get to tie their advertising in with this unique opportunity. A TechBargains survey showed a high amount of mobile video viewing and social interaction is expected during the games. It revealed that, “Nearly half (44%) of respondents said they would interact with social media often or very often during the Olympics.” As a brand or advertiser, how can you capitalize on what is at the top of everyone’s mind? One way is to conduct mobile polls that build on the concepts of competition and winning. While the ad stays up, the viewer sees a flag and country name for each of the participants. Then it goes to full screen with the question again and shows each of the countries so the user can vote. The next screen presents voting results and invites viewers to post their pick to Facebook or Twitter. The mobile advertiser gets a good amount of on-screen time while the user thinks about the event and the advertising sponsor. It’s engaging and effective. QSR (Quick Service Restaurants): Use HTML5 mobile rich media ads to get consumers thinking about the food choices you offer. They could vote on what they think is the healthiest menu item from your restaurant to eat after a competition. Then offer a discount on the winning food to whoever voted. 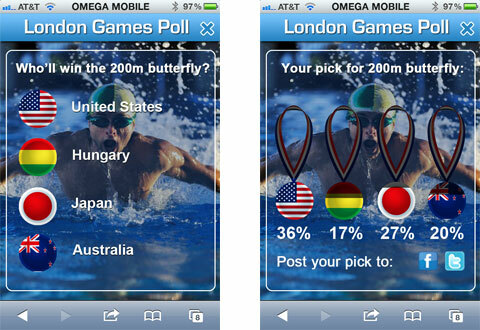 Travel: Show footage of all the London sites and then sponsor a poll about where the ideal games should be held. As visitors vote on specific locations, tie that in with footage of the suggested site and offer great travel deals so they don’t have to wait any longer to see it for themselves. Retail/Fashion: A retail store could have fans vote on the best outfit to wear to a sports competition. Participants could receive coupons for their winning ensemble. A sporting goods store might sponsor a poll about which athletic apparel helps you perform at your best when swimming, playing volleyball, or shooting hoops. Mobile advertising related to large-scale events is all about taking advantage of timely opportunities and thinking about how your brand’s product or service ties into the event. You can have fun, engage users, and increase sales with this type of marketing strategy. Just remember, it’s great to tie in with a major event for branding and awareness, but the point is to get somebody to take an action regarding your product or service. InteractiveTV today had a post about an outdoor advertising campaign that uses shoppers own faces for a gigantic DVD promotion. It’s a high exposure campaign showcasing unique user experience design. And it’s a perfect fit for mobile. Inwindow Outdoor, a company that does digital storefront and mall advertising, launched the interactive augmented reality display at Los Angeles’ The Grove, to promote the Blu-ray release of “Avatar.” The display is a free-standing structure of multiple digital screens. Using technology developed exclusively for this project, shoppers faces are morphed into the wide-eyed blue creatures from the film. Once the morph is complete, users can enter their email address via touch screen, in order to be sent a video of their transformation, along with information on where to purchase the Blu-ray disc of the movie. Down the road, this will be able to happen via a mobile. Imagine getting a message from a friend with their facial expression (or their kids or boss or pets) mapped to a branded character. This is a great way to build a buzz for any animated or costumed character-driven film – think Iron Man or Shrek. Send it to yourself, friends and family and some transformations are sure to go viral when they hit the social networks. The display was introduced last Friday and set to run for a month – if you’re in L.A., check it out. Mobile Marketer had a feature on Jumptap, a company who delivers mobile ads revamped their mobile ad network. Jumptap is taking mobile ad personalization to a new level. They’re giving consumers the ability to tell brands what they want, when they want it. Mobile users will be given the ability to manage their own profiles for a more personalized brand experience. This is the key to the future of advertising – letting the consumer specify what they want and delivering relevant ads. As I’ve mentioned in previous posts addressing ad personalization, why not target consumers with a product they are likely to buy? In addition to serving the consumers, this gives advertisers the ability to serve better ads. Targeted spots will be more enjoyed and appreciated when they’re given to the perfect audience. 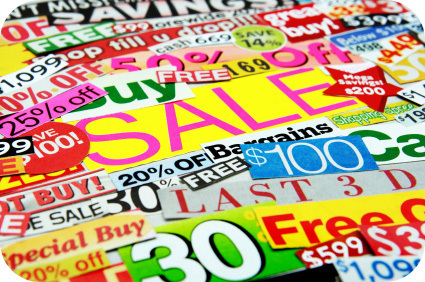 Additionally, consumers can reveal demographic information in exchange for special offers, coupons, deals, or less ads. In return, advertisers get valuable stats on their audience and consumers get even better results from their mobile user experience. Moblie Commerce Daily had a story about a new app that is a great bridge between the physical and the virtual. PixyMe takes the mobile user experience to pretty cool place. PixyMe is an iPhone/iPod Touch app that uses image personalization. Users can send or share photos via the usual social media channels. The twist is that you can then have your image printed on a postcard and mailed with a stamp anywhere in the world. You don’t need a personal image – the app will integrate a name, word or short phrase into an object within a stock photo – making it look like the words were written in leaves or as fireworks in the sky. Click here to try it out with your name. At $1.99, PixyMe is consistently a best seller for Apple. You’ve heard me say that successful apps can’t just make use of cool technology or look pretty. PixyMe is a perfect example of a smart app that fits a real-world need. How many times have you been on a trip and wanted (or promised) to send a postcard but you forgot? The whole stamp/mailbox thing is such a hassle but everyone loves getting non-junk mail. And the personalization angle is great for family, friends or even as a business tool. A feature to remember contact groups – like friends, family, coworkers – would make reuse of the app even easier. A good idea would be to offer discounts for bulk mailings – instead of sending one card, you could send the same image to multiple contacts. A feature to remember contact groups – like friends, family, coworkers – would make this easier and encourage use over and over. For example, I’d pay extra for the convenience of being able to mail out a holiday card if I missed the deadline to go the standard print route. Some additional features ideas could be special offers that kick in based on holidays around the world, discounts for promoting PixyMe on Facebook, Blog or Twitter or maybe a sweepstakes for the most creative use of the PixyMe app. Why Not Design Intelligent Mobile Video Ads? A few trade stories this week about video ads suggest a opportunity for intelligent mobile user experience design. MocoNews reported on a Google blog post about how the company is beginning to monetize the mobile version of the video site. Banner ads will show up on the home, search and browse pages of YouTube when accessed via mobile. Meanwhile, AllThingsDigital.com linked to an editorial about the hatred for pre-roll video as well as its effectiveness. If pre-roll ads are to become the norm, why not design the mobile video ad experience to be intelligent and adaptive? Why not combine pre-roll with dynamic content tailored to the users? Not everyone needs to see the same pre-roll ad. I’d answer more questions to reveal demographic information in exchange for seeing less ads. If not less, I’d definitely prefer to see an ad of interest to me – like movie trailers - rather than the many makeup commercials I’ve been forced to endure before watching online videos recently. I’ve recently seen Hulu offer short surveys in exchange for an ad free episode. The experience was hassle free. Multiple pre-rolls could be created to serve different demographics – male teenagers see video game previews, new parents would get baby products, affluents would get luxury commercials, etc. So why not give users ads that they want? Targetted ads will result in better ad spends and more purchasing. Fast Company reported on a new promotion that might be a glimpse into the mobile design of smartphone commerce in the future – advertising that combines virtual goods and LBS to tap into on-the-spot purchases and promotions. Location-based game start-up Booyah is introducing in-game, virtual goods placements, based on your real-time location. The Mobile User Experience Design will lead consumers right to the cash register of a “real” store selling real goods for very real cash. The campaign stems from Booyah’s partnership with international clothing retailer H&M but this could apply to ANY consumer campaign – from liquor to cars to network television. This particular promotion pings mobile users near an H&M location on a piece of clothing or accessory that appears in Booyah’s MyTown location-based social game. 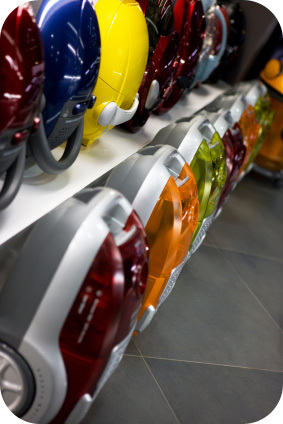 Discounts and promotions reward the Booyah user that visits the actual store location. Here are some ideas I have for additional location based campaigns. Again, any consumer campaign could benefit. 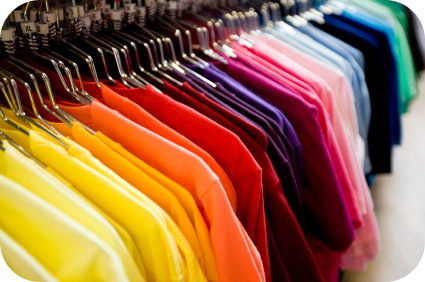 Users could be rewarded with free virtual goods if they spend a certain amount of time inside a retail location. The goods should have a high value perception and be unique to that store. If the user wore or showed off or used a virtual item in a social network, they could get real world discounts on that product line. The biggest fans of a company – the ever valuable influencers – could receive limited edition virtual that are exclusive or awarded before general public release. Feedback about the unique product could be analyzed and the most popular ones could turn into physical products. Another way to engage users (and potentially spark a viral campaign) would be to give the consumers tools to design the next generation of virtual product ala crowdsourcing. Implement a voting aspect and social network exposure to build buzz. Winners could get a high value prize and their creations could turn into physical goods. Imagine a fashion oriented tween designing virtual fashion items and being rewarded for it. Unique mobile user experiences and advertising seem to be made for each other – mobile is also a great bridge between the physical and the virtual. I’ll be watching the H&M campaign with interest. A recent study sited on textually.org revealed that more than half of consumers in 11 countries used their mobile phones while shopping in a store. Uses included comparison shopping, getting peer feedback, looking up product information and finding coupons. I recently did exactly that. I was browsing a bookstore and picked up an interesting title. After looking up a great review on Amazon, I made the in-store purchase. Then I added other books to my Amazon cart to look up later. This should bring a sigh of relief to traditional retailers as well as a call to action. Retailers need to explore how the physical in-store experience can be complemented and enhanced by mobile. 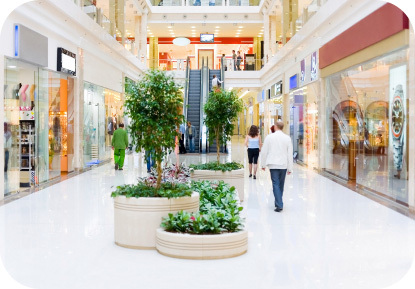 One great way to blend shopping and mobile is with visual searching. The Nokia Point & Find is a good example of how this could work. Forget about waiting around for a sales clerk. And what are the chances that a retail employee is knowledgeable about every single item in a store? It would be great to just snap a picture of an item or hold your device up to it and get instant information. Large retailers could really benefit if they had their own app. For example, if you were at Best Buy, the app would provide information on the in-store product as well as suggesting additional purchases (a power cord, batteries, etc. ), giving details of the warrantee program or outlining a special credit card offer. The opportunity to access exclusive offers, coupons and discounts in-store with a mobile device would be great. Also, retailers should make spreading the word to your social network or an individual contact as easy as possible. The next time you head out to shop, remember that your mobile is a great companion. Verizon continues to blend their product offerings through a converged mobile user experience. 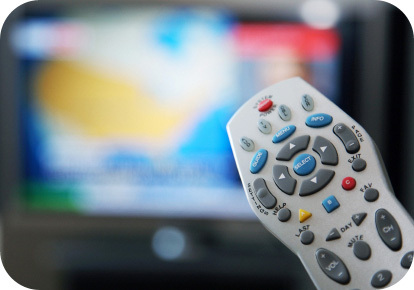 InteractiveTV Today had a post detailing the variety of FiOS TV features that will soon launch. There are some cool elements that also have practical real world use - a good example of a multi-screen experience. I was particularly interested in the news that Verizon will soon release software that will let viewers to use their WiFi-enabled smartphones as a remote control. Through a remote access service, Fios TV subscribers will be able to use their mobile to review, change or add recording requests, delete recorded programs, browse and search TV and video-on-demand listings, and set parental controls. Mobile devices are so much more sophisticated than the typical remote – it’s a great use of mobile technology. This opens up a host of possibilities to bundle Verizon TV and mobile services together - building consumer loyalty and expand Verizon’s reach. A good example of this might be Verizon suggesting new content purchases based on shows or music you’ve watched or programmed to record. By utilizing one device as an extension of another, new user experiences are possible. For example, when watching FIOS TV and you see an ad for a show you want to watch, you don’t have to interrupt your viewing experience on the television. You just use your mobile phone to set the show to record. Other features include an enhanced Interactive Media guide for FiOS TV as well as “bidirectional sideloading”—which allows viewers to use their TV to access digital files from mobile phones attached to their PC’s. There will also be an interactive TV application that allows you to watch free samples of premium channels with the option to order as well as various widgets, like the football widget that displays statistics alongside a game. I’d love to see more social tv features. For example, notify when my friends are watching tv, let me know what they’re watching, let me invite them to watch something with me, etc. Best Buy is the latest retailer to jump into the rapidly expanding Augmented Reality pool. Adverblog had a post on the new “Best Buy in 3D” campaign. Users can take Best Buy’s Sunday paper insert, weekly retail publication or in-store circular and use it (with a webcam) to experience the advertised products in 3D. Additional purchases to compliment a purchase of that item. Additionally, with GPS, the extra features could be tailored to the section you’re standing in. For example, if you’re in the video game department, you get video game specials. Also, with a “smart” feature, the application would remember that 3 months ago you made a specific purchase at the store and suggest additional items to buy. For example, buy ink for a printer. Clearly, augmented reality is not just for selling stuff and it’s going to blow up like crazy in the coming months. I just saw that multi-platinum Grammy winning rapper Eminem is on the cutting edge with his “Eminem Augmented Reality Competition” Could education be the next frontier for Augmented Reality? What industry do you think will jump in next?